The show is from Feb 6 -10 2019. Is anyone up for the meeting of the minds and a beer on the 7th at 6pm at the usual place. Also a good time to see all the widgets you just can't live without. The Portland Sportsman Show will soon be here (Feb.6 - 10). Anyone in the area around 6 pm Thursday, Feb.7, I hope to meet you at the West End Bar and Grill (East end of Building D) for a burger and a beer. Good idea! Honey, I bought SF a new boat!!!! February is my dry month, but I'll be in for a burger! Putting it on my calendar, and looking forward to meeting some of you guys in person. I plan to be there. Let's not have another snow storm. Worried that the miscreants Mark and Russ might get us in trouble. Can innocent bystanders plead the 5th?? Red that must be a heart breaker !!! Enjoy your trip and catch a big one. We expect a full report And like they say no pictures it didn't happen. It would be hard to beat your 19 with that awesome Salt Boss top! SEE You there. I need to give SF back his fuel tank...it just is not a fit! Hope the snow treats PDX kindly. I've been there during freezing rain "silver thaws". Not fun. The 'Seattle Slide' is active. Looks like the next snow storm will happen Friday so I’ll be able to make the run down there on Thursday! 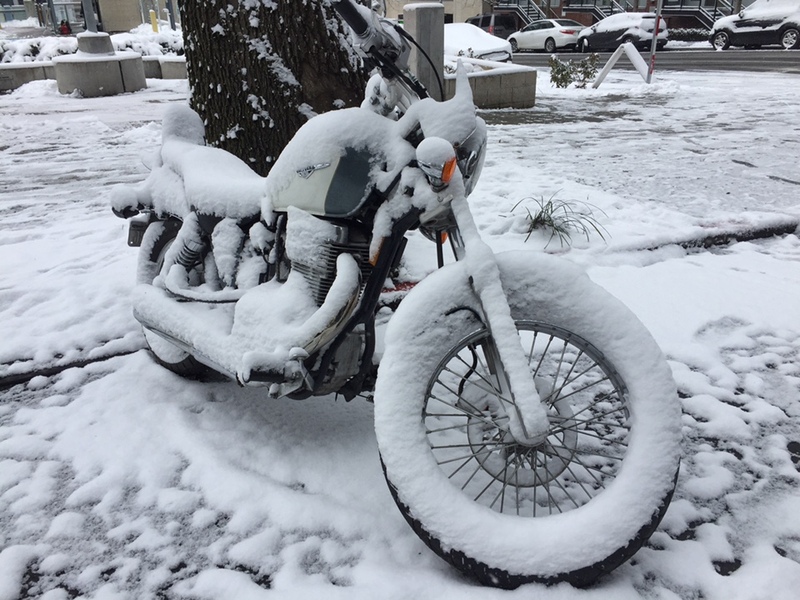 Pic 1 random bike downtown after snow. 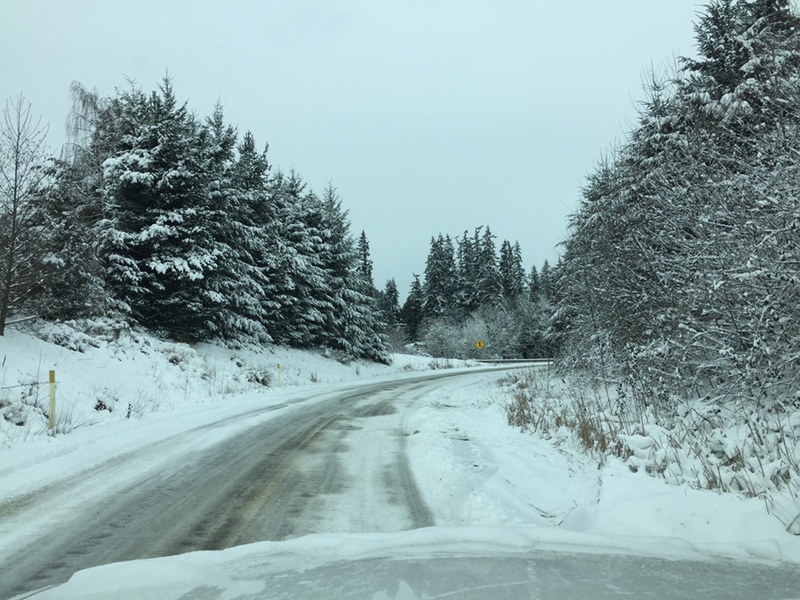 Pic 2 road on South Whidbey on the way to Langley from Clinton. 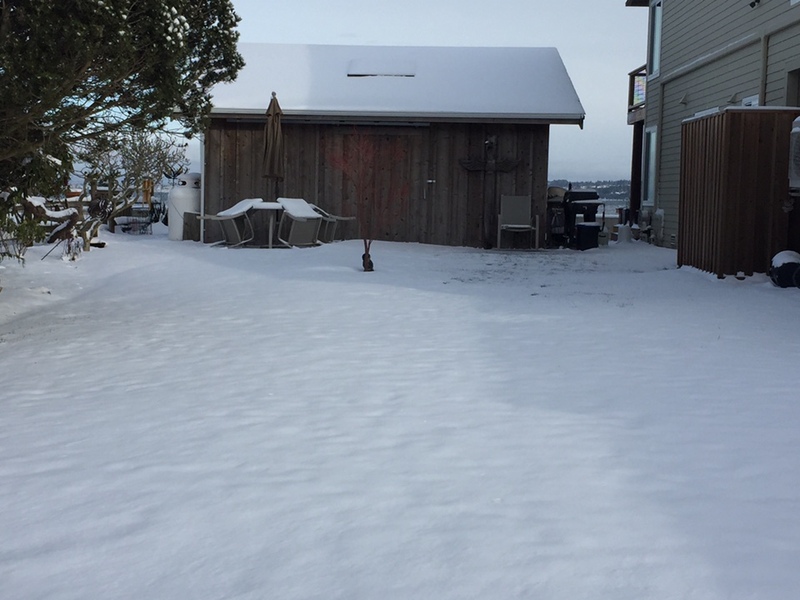 Pic 3 our cabana in the snow. These are all color pics, it’s just gray here for a few months in winter! Ha, just the base of a young Japanese maple.... can’t see the branches against the cedar boards. Well I was there....but I was at the show all day. So I un-remembered the meet time! I was there at 6PM. Five guys were there and Stream Fixer's Doppleganger was at the table with four deciples. This guy looked just like Russ! So I listened in a bit and said to the guys there "What are you guys all dressed up For"? They kind of chuckled a bit except for the Russ-like who was deep in some deer hunting moment. I said this is the Arima Group...isn't it? The guy across from Russ (as I called him...he never corrected me...) said ARIMAS ARE GREAT BOATS...have a seat. The boys were talking Columbia river stuff Russ was telling about a place he found fishing somewhere where the local guy told him in no uncertain terms not to tell the Portland @^*)$@! about this place or it will be ruined. We were having a fine time then I blundered out "are we having a lead pour this Spring?" The skinny guy (that should have been a clue) said "they want six bucks for a 20 oz sinker" at some shop by him. Hmmmm... this is not the Arima guys after all... "Russ" was looking at me funny. It was late I had a train ride home to Gresham. I drove down from Whidbey today and met Greg in Olympia the we rode together to the Portland show. Hydrotherapy Larry, Ohmytodd Todd, Kodak Greg, Streamfixer Rus, Eric and I met at the end of the show for a drink and dinner today. Great to meet new guys- was particularly impressed that Todd has read almost every post in our Arima Owners entire history! Course, it’s also great to see the old guys, a club which I feel I’ve joined with the passage of years. Had the additional bonus of meeting up with Vancouver Techie at a gas station where he delivered the hard top panels that I’d bought over a year ago from another member here. The Arima Owners delivery system really works and is free! The Portland show is awesome with trucks, boats, motorcycles, campers, fishing resorts and every piece of tackle that you will ever need. Great show. Greg has a pic that our waitress stood on a chair to snap. Hope he posts since we are an excellent looking group! It was great to meet some of you guys in person, that was really fun! In hindsight, we should have grabbed a pic WITH the waitress - that would of made us all a little bit better looking ;) Maybe next year! I hope to make it down to the saltwater show in Salem to meet some more folks in a couple of weeks. The Restaurant closes at 7 and only had 3 beers on tap -- "Oh and we have Coors Light in cans"
Pulled pork tacos were good too!